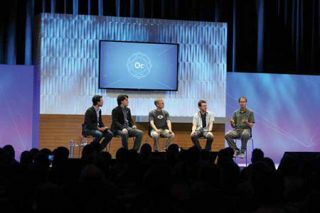 On September 20, 2014, virtual reality headset-maker Oculus hosted 1,000 delegates at “Oculus Connect” in Hollywood, CA, the company’s first developer conference. FNtech, the Fountain Valley, VA, technical services company that produces Oculus’ Facebook video channel, experienced its own first at this event: It was the first time that FNtech used a digital intercom system to cover a live production. To make this leap, FNtech again went with Clear-Com. Specifically, the company purchased two Clear-Com HMS-4X HelixNet Main Stations, plus 20 2-Channel HelixNet beltpacks. FNtech also acquired two Tempest wireless base stations, each of which came with five Tempest wireless beltpacks. Each HelixNet Main Station was connected to a Tempest base station, with the two HelixNets being linked to each other by fiber optic cable. The HelixNet’s wired beltpacks were used by FNtech staff working in fixed positions, such as the FOH/backstage audio boards and the camera positions. The Tempest wireless beltpacks were worn by roving crew members, so that they could stay on the move without ever losing connectivity. FNtech’s experience with moving to an all-digital intercom system—one that meshes nicely with their all-digital audio production backbone—proved to be a very positive experience. In fact, making the switch while covering Oculus Connect proved to be painless, while the enhanced audio performance, flexibility, and coverage provided by the HelixNet/Tempest combination actually made production go smoother than before. James Careless is a regular contributor to NewBay Media’s AV Technology magazine.